ShopNBC has a cute promotion today for the blue moon: It is offering customers six ValuePays on any item for the day. The “Once In A Blue Moon” special might help those who have had a big-ticket item, perhaps a Gucci watch, that they want to buy on ShopNBC but couldn’t swing in one big bill. A “blue moon” is when two full moons appear in one month. December’s second blue moon is happening tonight, New Year’s Eve. We got the first scoop on “Jerseylicious,” the new reality TV show that Style Network that just finished shooting in December. The “comedy docu-soap” will premiere in March. where our package of stories on “Jerseylicious” was just posted. In early December on a Friday night we traveled to foreign territory for someone like us from North Jersey — Green Brook in Central Jersey — to go to Gatsby Salon. “Jerseylicious” is about Gayle Giacomo, the salon’s owner, who is trying to relaunch the business after moving it to a new space just a few doors down in a strip mall on Route 22. Afte getting lost on Route 22, we finally found the beatiful new Gatsby and interviewed Giacomo, a pretty redhead with huge grey eyes; her daughter Christy Pereira, the salon’s manager; Olivia Blois Sharpe, the petite brunette with a penchant for lace leggings, leopard skin and low-cut tops, who is a makeup artist; and the only man in the “Jerseylicious” cast, a very lovable Anthony Lombardi, who got into the hairstyling business to meet chicks. We felt right at home with these Jersey-bred group, who were down to earth and affable. Giacomo and her daughter Pereira are very close, and live only a mile apart in Bridgewater. Sharpe lives in Montville, and Lombardi resides in Fairfield. 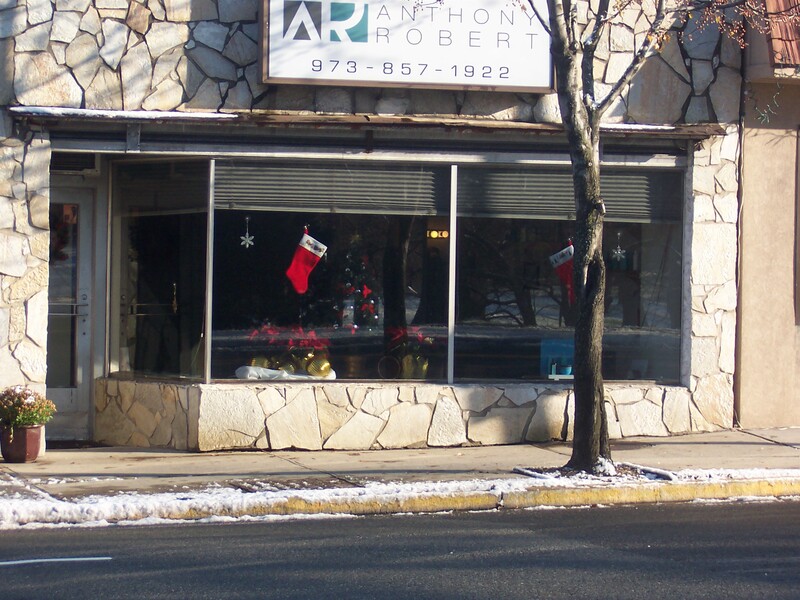 He also owns his own salon, Anthony Robert Salon, in Verona on Bloomfield Avenue, about five minutes from where we live in Montclair. We don’t if “Jerseylicious,” and its tale of these Gatsby employees who range in age from their 50s to their 20s will be a hit, but it should generate a lot of interest among folks here in the Garden State. If you live in Jersey, who may know someone connected to the show. We go to Bangz salon on Montclair, and out hair stylist said that earlier this year, the producers of “Jerseylicious” were in Bangz, seeing it as a potential site for “Jerseylicious.” The Bangz staff had to fill out some questionnaires, but it did not pan out. And Jersey residents may recognize places they have been on “Jerseylicious.” The show filmed at the upscale CoCo Pari boutique in Red Bank, where we couldn’t afford to shop even when we were employed. “Jerseylicious” also shot at the 46 Lounge in Totowa. We’ve always wondered what the place was like, but if Sharpe goes there, it’s definitely too young a crowd for us. We can’t wait to see how “Jerseylicious” turns out. We think it will portray New Jersey and its residents in a much warmer light than that crapola “Jersey Shore”: as down-to-earth, no-nonsense, unpretentious, hard-working, funny people — with our accent. And what’s wrong with leopard skin, anyhow? We love it. Please correct us if we’re wrong, but Prai beauty products, which we seem to remember were on ShopNBC, are now coming to HSN. HSN already has many of the Prai products, which include serums, eye and lip creams, and perfume, on its Web site. “Prai combines the latest breakthroughs in anti-aging beauty with the skin smoothing and perfecting benefits of prai root essence to provide results-oriented formulas with silky textures,” according to HSN. Damn, we can’t keep up with all these vendors moving back and forth between ShopNBC and HSN. The “Sunday Styles” section of The New York Times today features a tote bag by HSN handbag designer Carlos Falchi, who was profiled by the paper back in late October. In the “Pulse” feature, in an item headlined “Sunshine in a Bag,” there’s a mention and photo of Falchi’s snakeskin-embossed microfiber tote. It retails for $255 at Bloomingdale’s. The Times has packed the Falchi bag with resort items, such as sunglasses, sandals and a bikini. You are currently browsing the Homeshoppingista's Blog By Linda Moss blog archives for December, 2009.